This exercise looks at some of the options available when you don’t want to light a whole scene and instead want to concentrate the light on a particular area or object. The exercise instructions are quite open, asking that I experiment with shaping light on an indoor shoot. It suggested that I use a snoot as a sort of spotlight to concentrate the light. Snoots are tubes that are used to aim light by restricting all light except for that in the exact direction the light is pointed. DIY versions can be made easily at home using card or, as I recently discovered through an Internet search, an empty Pringles container. I didn’t have to do this as I have recently invested in a Flashbenders, positionable reflector that I was able to use this for the task by fixing it into a cylindrical shape with the velcro, positioning it over my speed light head and fixing it in place with the attachment straps. Grids are another tool that goes between the light and the subject and controls the light in much the same way as a snoot. As I don’t have one of these at home I undertook a Google search and found out that there were quite a few DIY versions that could be made at home with very few materials. I decided to make a grid from straws that I found on http://www.strobistindex.blogspot.ae. I couldn’t seem to find black straws anywhere so set about colouring the yellow ones I did have with a permanent black marker. Luckily the marker had a broad head and this didn’t take as long as I imagined it would. 2. The arrangement was perhaps too small and therefore the light from the snoot and grid was covering too much area. I set up another still-life arrangement, this time larger, showing a chair with a purse, scarf and some beads arranged on top of it. I positioned the speed light, high on a stand, some distance away from the arrangement, facing the chair and pointing down. I began shooting with the snoot attached to the speed light. I began with the flash on the weakest power, 1/128 flash output and then gradually increased it to find a level, which lit the scene best. I intentionally made the scene dark so that the spotlight effect would be clearly seen, however this created major problems for the exposure and resulted in clipped shadows in the exposure. Therefore, I had to brighten the room a little with light from a small tungsten lamp, positioned at the far end of the room, behind the speed light. I also used Bulb mode and a shutter release cable. I took first a shot with the snoot attached to the flash at ¼ flash output and then with the grid attached. I converted both images to black and white in PSE 11 to keep the emphasis on the light and dark tones of the scene without the distraction of colour. The snoot has directed the light towards the chair top lighting the objects that sit there. The light fall off from this spot has left the upper corners of the scene quite dark which helps to isolate the chair as the main subject. After a few test shots I realised that with the grid attached to the speed light that I would require a longer exposure time. Even after doing this you can see that the overall image is darker as the spread of the light is tighter than with the snoot. 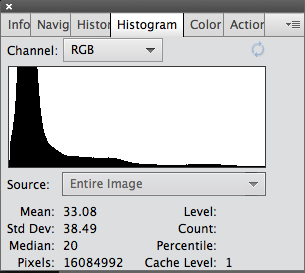 While the shadows are not clipped the histogram does show a predominately dark distribution of tones. What influenced the different results? The flash output and light to subject distance were the same in both photograph, therefore the light intensity was the same, just distributed differently. This got me thinking about the individual qualities of both of these light-shaping tools. What was it about the grid that directed the light in a narrower spread? I searched through my textbooks and various photography websites before I got some answers to my questions. In photography lighting for dummiesit states that it is the length of tube in a snoot or grid (or straws in my case) that defined the shape of the light. The longer the tube, the more defined the light. In terms of the spread of light it seems it is the diameter of the tube that influences how wide or narrow the spread of light is. The more constricted the tube, smaller the resulting light. The snoot I used was approximately 8cm across, resulting in a wider spread of light, while each of the straws I used were 0.5cm across, resulting in a narrow spread of light. This also made me think that had I used a snoot or grid with narrower tubes that I may have got better results on my initial attempts at concentrating the light onto the tabletop still-life arrangement. This was an interesting exercise that I seemed to have spent a rather long time on. However, carrying it out has encouraged me to experiment and seek out further information on how light behaves and how the light modifiers work. This entry was posted in 20d-Concentrating the light and tagged Grid, Light, Snoot on October 13, 2013 by catherinefinniganphotography.